I think the sheer prospect of doing justice to our efforts on that temperamental day back in August had intimidated me into a three month writing hiatus. Plus, lets not forget my inherent laziness as a person. And GTA V, of course. Many an hour on GTA V.
However, I will now proceed to give it a go and do what I can to chronicle with mere words the day that was Yamb, Lamb and Ham…Please Sir, I Want Some More. There is a healthy element of debate between the three of us (Skinny Pete, Pete Croft Baker and I) as to who’s idea this was in the first place. I can only vouch for my portion (Michael Pollan) but, if there is an ancient barbecue deity out there somewhere, I imagine he had a greasy hand to play in bringing us all together with a glorious vision. 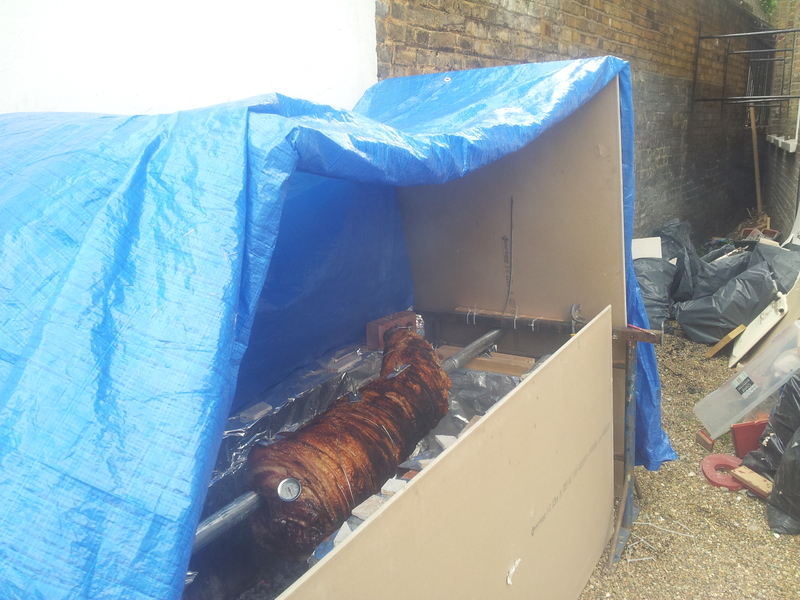 To roast a whole hog on a homemade BBQ in a small Brixton front garden. Naysayers were certainly not scarce (“What’s the point?”, “Why don’t you just pay someone to roast it for you?” “You’re going to poison everyone!”). Actually, these were all from just Laura but there were plenty more. I like to think we won them round in the end. 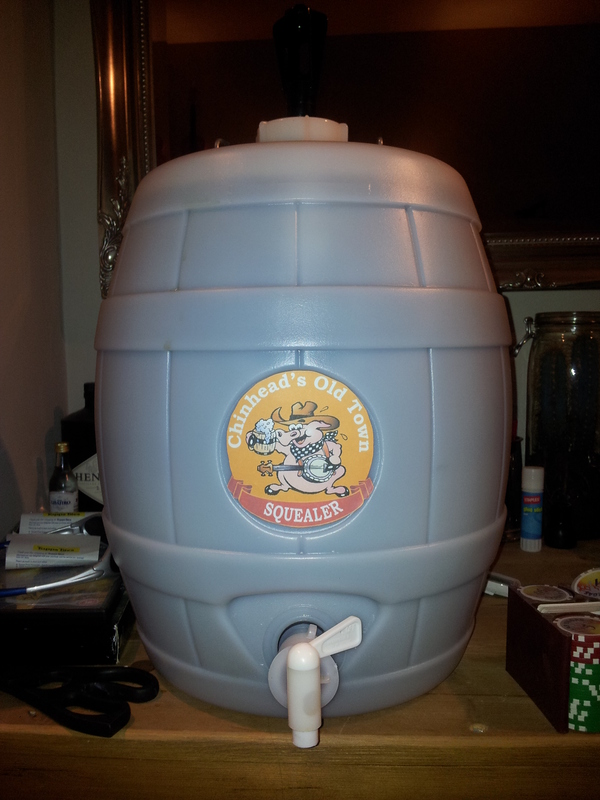 The pig (a Gloucester Old Spot) was sourced from a great little place called Keythorpe Valley Farm in Leicester. Due to a slight miscommunication, the old fella was slaughtered a week early. This was fine at first as it could be kept on the farm in the fridge for five days. 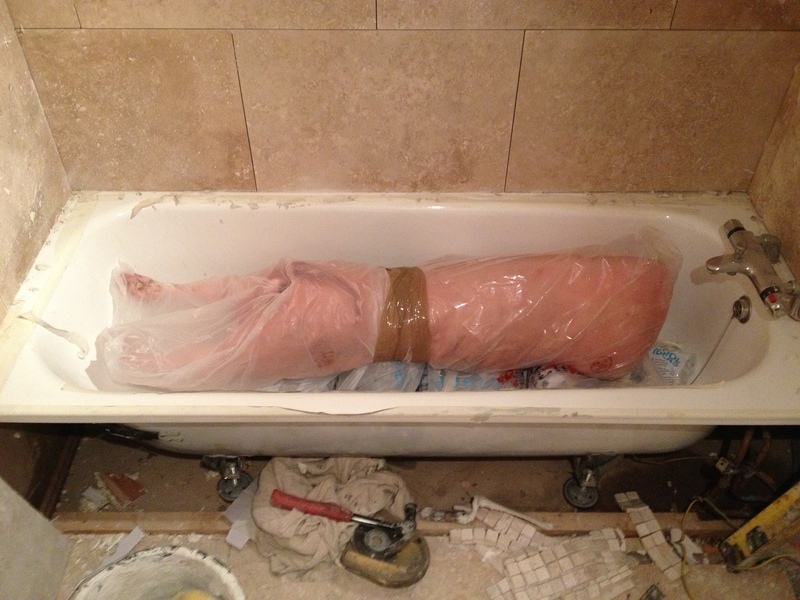 However, it then had to be released to us a day early which resulted in an overnight stay in Skinny’s bath tub (below). Again (as would become a recurring theme to the next 36 hours), this was a perfectly agreeable solution in theory. 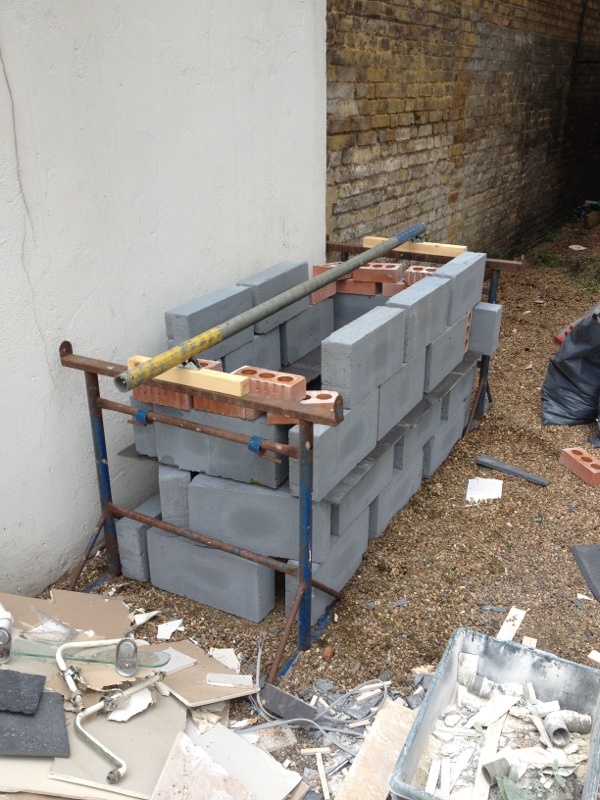 What Skinny failed to realise though was the plumber (hence the tools, great time to redecorate) had detached the bath. 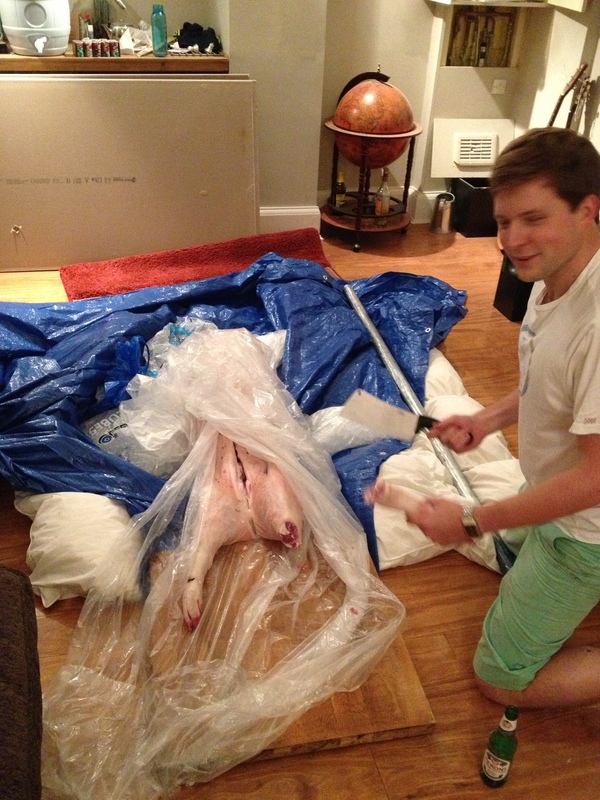 This meant that come 2 a.m, pig juice and ice water began pouring through the ceiling. Grim yes, but the Tarantino-stylings weren’t to stop there as we moved into the prep the next evening. The Cleaver. Great new addition to any kitchen. Aside from what proved to be the relatively straightforward job of lopping off her legs and tail, it all got a little weird for a while at this stage. 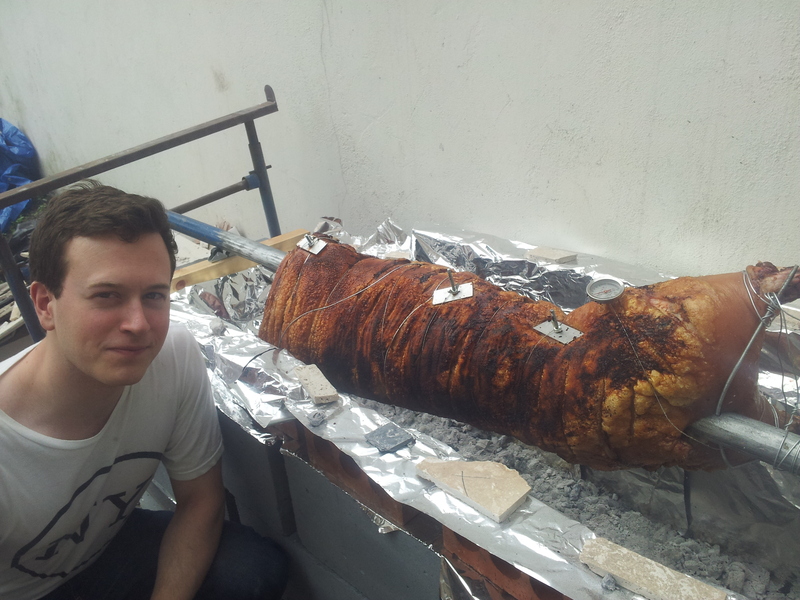 In retrospect, it was a heady combination of the beer, the late night and lugging around a 50 kg pig corpse. But what tipped the transition from a little weird to downright surreal was PCB putting on our backdrop music Seasick Steve Never Go West. It was to this soundtrack, which reminded me of the True Blood theme song on crack, that we proceeded to hammer in our (sanded and sterilised) scaffolding pole into the pig. I literally mean hammered with a sledgehammer. The hole wasn’t big enough. Picture that if you will and listen to Seasick Steve and you’re someway there. But huzzah! We got there eventually! I should at this point mention the oven itself. This was an incredible feat of ingenuity and all credit must go to Skinny Pete for its design and build. We’re all glad that those four years studying Mechanical Engineering have finally been put to good use. This was certainly his Magnum Opus. And hardly cost anything. Cashback. As I cycled down to Skinny’s from Clapham at 5.30am, BBQ grill strapped to my back, I remember a distinct feeling of nerves and excitement. In theory (that phrase again) everything was accounted for. 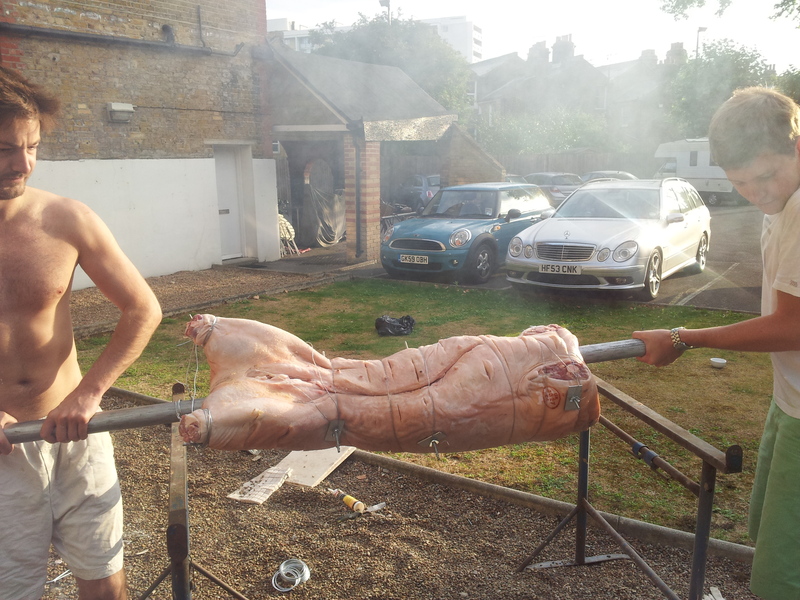 The pig was fully primed, we had a fat drip, there was ample booze, Laura was on apple sauce duty, there was lamb for non-piggers, it only promised to shower occasionally etc etc. But I couldn’t shake a feeling of apprehension. We had one-hundred people due round for food at 3.30 pm and a completely raw pig spread eagle of Skinny’s lounge floor, violated by a scaffolding pole. 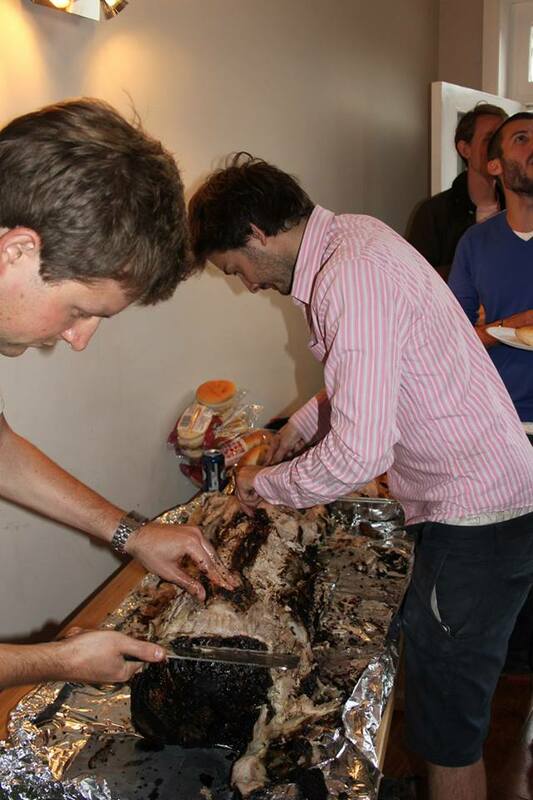 Aside from the responsibility, I think a big part of the nerves was wanting to do the pig itself justice and cook it properly. Part of the reason we had all agreed we wanted to do this was to get closer to our food, away from the endless packs of chicken breasts and sausages that are arguably a far cry from meat in its honest form. Anyway, enough of the amateur philosophising. We stoked the first of many (many) bags of charcoal, hoisted our good lady onto the pit and away we went. 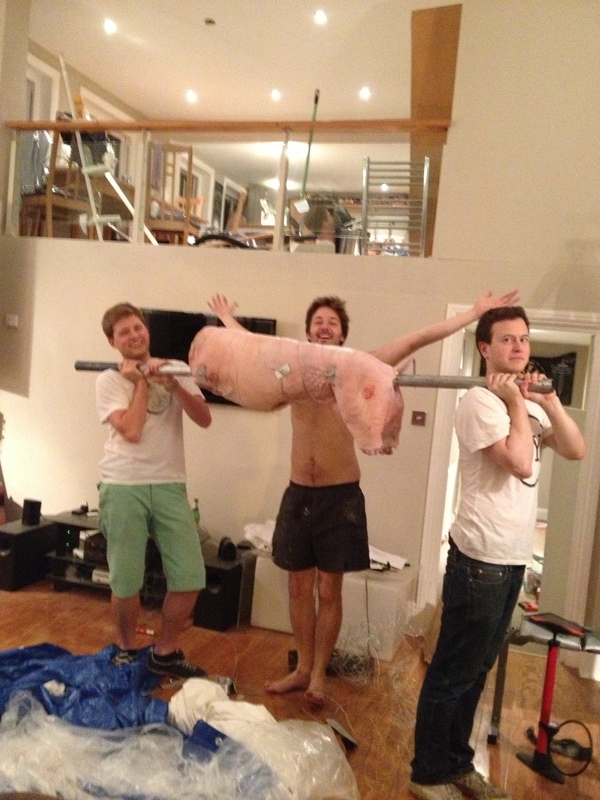 Although Skinny’s rolling joints for the pole were another spot of genius, it did mean that every 10-15 minutes for 12 hours we had to manually turn the pig. It was also a two man job. Labour heavy, sure. Would it be worth it? Absolutely. All went swimmingly for some time. 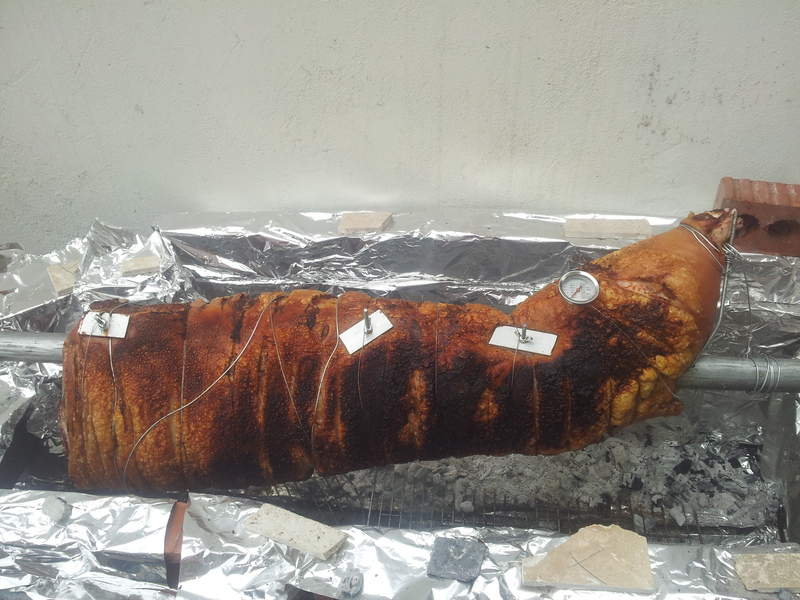 Not a drop in the sky, skin crackling up nicely, fat tray working like a beauty. Even when it started to rain, we took it in our stride. Constructing not only a practical, efficient shelter but one with some panache. Looks too good to be true at this point. And it was. Ten minutes later, only a couple of hours before she was ready to serve, one too many coals plopped into the increasingly clotted fat tray at the bottom of the pit. 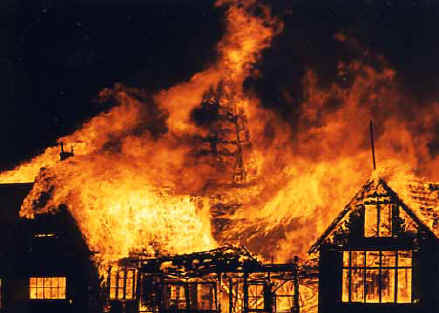 I have never seen a fire so quickly erupt from nothing in all my life. It took the tarpaulin, the board and half the top of my hair with it as well. 5pm. The moment we had all been waiting for. We hoisted our dear friend onto our shoulders once more and carried her into the lounge, placing her on the dining room table that would serve as her final stage. The hog was served and I took a much needed shower, although I didn’t feel clean again for several days. And my hair didn’t grow back for several more after that. 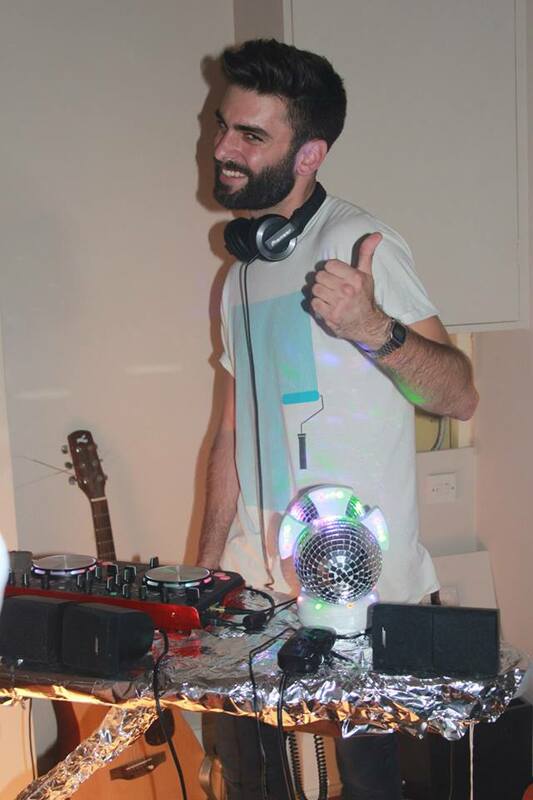 After the food, there was much merriment and dancing, with our very own wedding DJ Dyson spinning the tunes until the early hours with his disco-ironing board and bushy beard. I wouldn’t actually know though as I was in bed by 10.30 pm, exhausted and contented by a monumental day of hogging with pals.